Most people know drinking and driving don't mix but did you know trees and volcanoes don't mix? Volcanoes? In Baltimore? Yep, I see volcanoes all over the city and beyond. Insects and other creepy-crawlies also tunnel through mulch volcanoes to reach now-softened, partly decomposing, chewed-on bark. It's like an open-door invitation to come in, chew through the wood and introduce any diseases they carry. 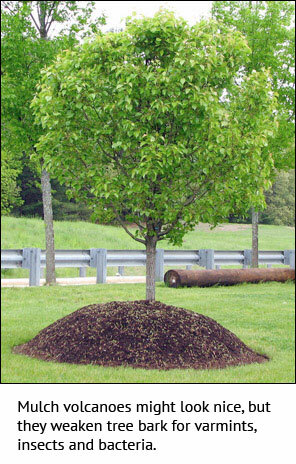 Mulch “rings” around trees protect the tree from lawn mower and trimmer string attacks, help retain soil moisture, keeps the ground cooler in summer and helps prevent soil heaving in winter. As the mulch decomposes it provides needed nutrients for tree roots. And it looks nice. So what's a homeowner or landscape professional to do? Size—A ring anywhere from a 2- or 3-foot radius around the trunk to the tree's drip line. Mulch rings should be a protection zone for the tree's roots. Give those roots as large a protection zone as possible. Depth—About 2-3 inches are plenty. Thicker layers of mulch inhibit oxygen exchange between tree roots and the air. Healthy roots need to breathe. It is okay to "cup" the mulch at the outer edge to help retain water but this is only used for 2-3 years on newly planted trees. Do not have any mulch touching the tree's bark. Well-intentioned people who don't know what is really happening to their trees often build the mulch volcanoes. Now you know better—spread the word. Please. Glenda Weber is the naturalist for Baltimore City Recreation and Parks. She leads the nature programs conducted at Cylburn Arboretum, and Howard Peters Rawlings Conservatory and Botanical Gardens. She can reached at [email protected].